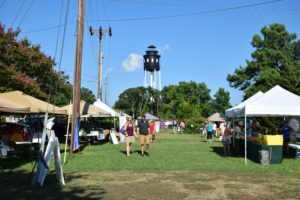 On the Eastern Shore of Virginia this summer, Tuesday afternoons from 4 to 6:30 pm are a special time in the little coastal town of Cape Charles, Virginia — particularly for foodies and farm-to-table enthusiasts. 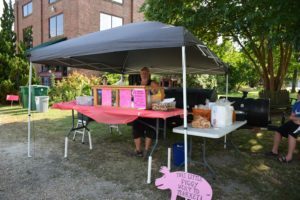 It’s a time slot that lots of locals ( and visitors too ) have set aside for a visit to the brand new Cape Charles Farmer’s Market. 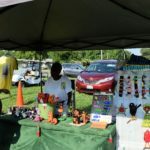 Located on the spacious grounds of the Cape Charles Museum on Stone Road, the Market takes good advantage of the Museum’s huge grassy front yard so there is plenty of room for venders to set up little tents to display their yummy wares. Wicker basket in hand, I traipsed from the parking lot over to the vendor area, not exactly sure just what to expect in the way of variety so I was pleasantly surprised to see so many beautiful fruits and veggies on display, some local artwork too, including some new designs from Mama Girl and tantalizing home baked goodies from Cape Charles Confectionery. But my first stop was at Shore Beef and BBQ, where owner Ron had smoky good aromas wafting from a sizable portable smoker grill hitched to his pickup truck, folks already in line, buying sandwiches and BBQ by the quart, pulled pork, beef brisket plus cooked-to-perfection ribs. My plan was to make a big circle, check out all the vendors and circle back around again to make my purchases. And that would have been a good plan if I had brought a bigger basket and if I had not stopped to talk to a few friends along the way and ended up having a detailed conversation comparing southern style creamed corn recipes. Who knew that “with or without bacon drippings” could be a major creamed corn issue– but trust me, it is ! ( And for those like myself, not originally from Virginia, south of the Mason-Dixon Line “creamed corn” does not contain a drop of cream, that is to say, dairy cream. Instead, creamed corn is made by cutting the kernels off the cob and then carefully scraping the corn’s own juices, the cream, from the cob with the dull edge of a sturdy table knife into a waiting bowl. This can be a pretty messy job, best done with the bowl in the sink to avoid corn splatters all over the counter. Now comes the contentious part, cooking the creamy mixture. Diehard Southerners almost always insist that sautéing in a generous amount of bacon dripping is the only true method. But transplants like myself often prefer olive oil with a bit of butter added at the end when seasoning with salt and pepper. And so it goes, where it stops nobody knows, the new vs. the traditional. Continuing on with my circle, I was captivated by a lovely display of cut flowers– nothing like a gorgeous bouquet to brighten any room, especially at the great farmer’s market prices, finally settled on the cheery sunny faces of a colorful bunch of long stemmed sunflowers. Further down the line found some local honey, so great on my Mother’s excellent recipe for fresh buttermilk cornbread, eaten warm from the oven and slathered with butter, then honey. 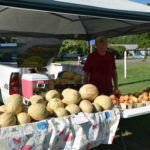 Saunders Orchard cantaloupes looked great, and so low cal as well as delicious. 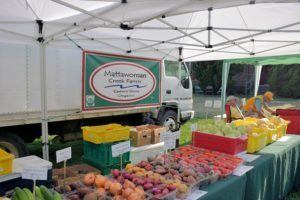 At Mattawoman Farms, a local CSA, some vibrant and crisp Swiss chard caught my eye, a rainbow of colors ready to sauté with chopped onion in …..you guessed it, a little bacon dripping, finished with a little cider vinegar. Yum. They also had some good looking kolorabi. I have never actually cooked kolorabi, I’ve looked at it, considered it, but never taken the plunge. This time was no exception, still haven’t worked up to it, next time maybe. But their Zebra tomatoes were keepers, small red orbs with golden stripes and so were the really ripe small tomatoes from Copper Cricket Farm, displayed in a sizeable bin and priced at ” select a bunch of them for $3.00″. By that time my little basket was about full but I headed back to the bread tent for a loaf of sour dough, hoping to try a recipe for an Italian tomato and bread salad, panzanella, that I had seen recently in the Washington Post. Doesn’t sound that great but I’m imagining that fresh artisan bread, lovely ripe tomatoes wedges combined with finely chopped garlic and fresh basil chiffonade, everything tossed in a delicate vinaigrette is going to be worth trying, we shall see. At any rate, when I got there the cupboard was bare and so the poor cook got none. But there is always next Tuesday and all the other Tuesday’s until October, so sooner or later a loaf of sour dough shall be available and a panzanella shall be made ! 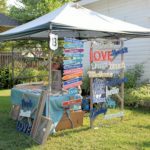 You are currently browsing the Life and Real Estate on the Eastern Shore of Virginia blog archives for September, 2016.